Gene has taken control of his pack after the devastating loss of his father, Rick the alpha. He has been preparing for this his entire life, but nothing could have prepared him for the brewing war, or the beautiful Talia. Talia trusts no one. If she had it her way she would take her son and run far away from everyone. But, she wouldn’t get far with her psychotic family after her. Going against her better judgment, she teams up with Gene in an attempt to end her family’s tyranny. 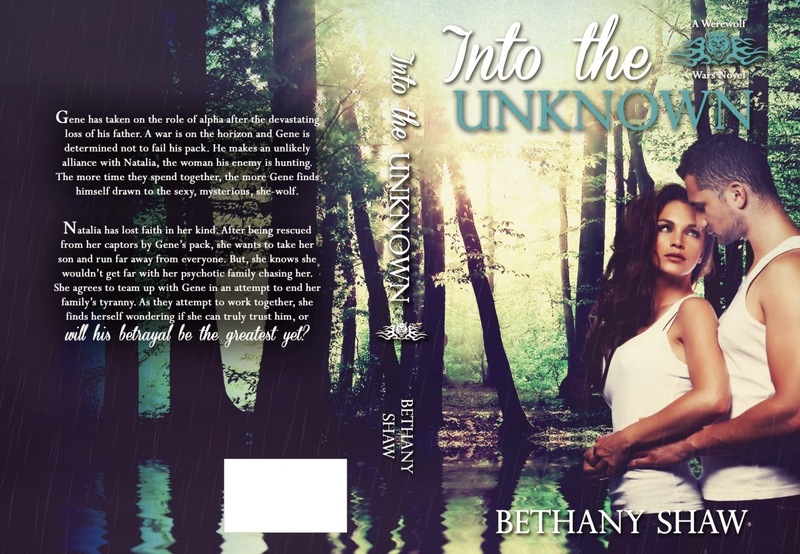 Bethany Shaw lives in Ohio with her husband and two children. She has been married to her husband for nine years and her children are five and two. She enjoys spending time with her family and friends. Some of her other hobbies include, reading, jogging, and family bike rides. Writing has always been a passion of hers and she is thrilled to share her work with you. My love for the supernatural. I wanted to create a unique world with realistic characters who have to work through the paranormal elements as well as the human emotions. With my family, reading, writing fanfiction, jogging, and going on family bike rides. What literary character do you most relate to? What is the thing you struggle with the most while writing? And how do you defeat it? Occasionally, I get stuck and I just reread what I’ve written, or I play the scene out in my head while pacing through the house—my son always asks what I’m doing when I do this. If you could spend a day inside a book, which book would it be and why? Any book from the Shifter Series by Rachel Vincent. When did you first realize you were an author? The moment I hit the publish button for my first novel, Out of the Shadows. If your book was made into a movie, who would play the main character roles? What kind of music do you listen to while you write? A little bit of everything. I have a iTunes play list artists range from Metalica and Linkin Park to Lana del Rey and Celine Dion. Watching the characters become ‘real’ people. What is your writing snack of choice? If you could go out to lunch with any literary character, who would it be? Natalia’s caring nature toward her son. It was deliberate as a mother it made it easier to relate to her as a parent. Thanks for visiting my blog today Bethany! And for all my blog readers, go check out her book at the links above!